what do I think about Apple versus Samsung argument ? And I think Samsung did copy Apple's iphone shamelessly but is what Apple doing a nice thing by chasing them and making them pay 1 billion dollar ? Apple is already the biggest company in the world, they already have lots and lots of money. I think they are being greedy now , why do they need to do anything to destroy their image ? This is gonna start a sue game between apple and other companies, Apple itself copied lots of things from small companies , but those poor companies are either too small to be able to fight apple or they just don't care or they are generous or they are open source and they are actualy happy that their idea is used in a product to serve society and technology. Taking into consideration that apple is already richest company in the world, Apple should not show anger that inspired other companies products, it should just be happy and shut up ! P.S1 : Samsung paying apple $1 billion in 5 cent coin no matter true or fake was so funny . 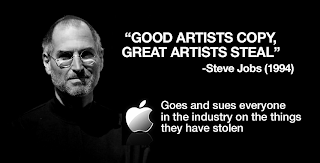 P.S2: I suggest Apple donate that $1 billion to fund open source projects, I think that way everyone would be happier, and Apple wouldnt look like a greedy money sucking rich man ! This story about Samsung paying in 5 cent coins is fake. Someone who posted it, did not take the time to write the source, because the source was dealing with producing fake news. It has also proven that 5 cent coins would take more than 30 trucks of space, A LOT more. I guess Apple did it to eliminate Samsung as primary competitor. Why I don't use netflix?